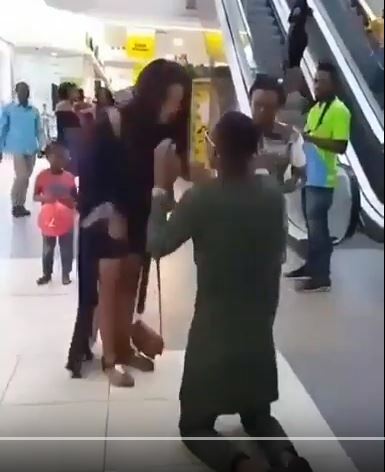 This young man dressed in a native dress staged a marriage proposal at the Ikeja City mall, Lagos State which is regularly a beehive of activities on weekends. As hundreds of customers went about their businesses, he suddenly went on his knees and brought out an engagement ring to propose to his light-skinned girlfriend. To his rude shock, the lady who didn’t sound too audible in a viral video screamed at him and landed him a dirty slap that had him falling to the ground. She kept insisting she would embarrass him as she called on on-lookers to come hear her out. The young man who couldn’t believe his eyes crawled on the floor in utter disgrace as he tried to appeal to the lady who wasn’t ready to hear him out. The video recording of the awry event has been trending on Instagram for some hours with social media users trying to unravel the identities of both parties and the cause of the drama that ensued. It would be recalled that public marriage proposal as copied from the western world has become the order of the day among Nigerian youths.